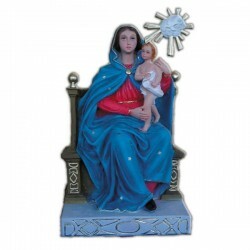 Statue of Seated Virgin of the Bow without crowns 33 cm. 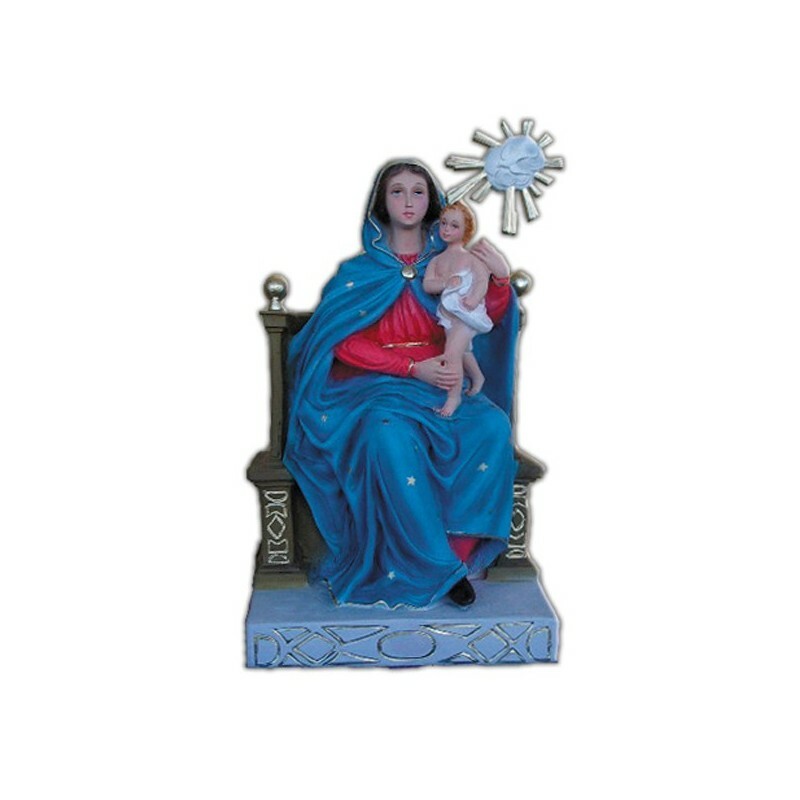 Virgin of the Arch is an important area near Naples. Its popularity is dued to the Shrine, that is visited by thousands of pilgrims (The most important after Pompeii). The story of this Virgin hails from the second half of the XV century, thanks to an episode during the Easter Monday, near Pomigliano d’Arco. It is narrated that some adolescents were playing football near a Virgin’s image that was placed under the arch of the aqueduct. From these archs derive the names of The Virgin of the Arch and Pomigliano d’Arco. During the game, after a bad kick, one of the adolescents began to swear and he took the wooden ball tossing it into the Virgin’s image, that began to bleed. The news spread through the village and the Count of Sarno, who was an “executioner”, made the youth hitching up at the lime. Two hours after the hanging, the lime shrivelled up under the crowd’s eyes. The “miracle” had a strong divulgation and it created a pilgrimage of believers who venerated the Virgin for their serious problems. On the 1 of May 1593 it was placed the first stone of the Shrine, that until then it was managed by the Dominican Fathers. On the Easter Monday occours a solemn procession in Naples and in the entire Campania. They are exhibited some standards with the Virgin’s image, with embroideries and painted images. They are carried for km by members of the Confraternity. The Virgin of the Arch is represented with the Baby in her arms, with a crown on their head and the Holy Spirit on a cloud with golden rays. Big golden brass spear, cm. 8,5x27.